When you think of the blue skies and sunshine of Southern California, whitewater kayaking is probably not the first activity that jumps to mind. But when La Niña relinquishes her grasp and El Niño storms brew, the steep canyons of Southern California spawn spectacular creeks and rivers, with whitewater as adventurous and scenic as any in the world. In the early eighties Dennis Johnson ran Malibu Creek and several other streams. About that same time, Royal Robbins, Reg Lake and Yvon Chouinard paddled Sespe Creek. The Santa Clarita River, Ventura River, Middle Piru Creek, San Gabriel River, and Tujunga Creeks were done early on as well. 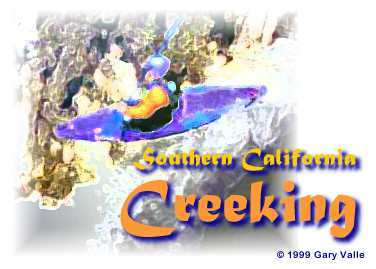 The El Niños of 1994-95 and 1997-98 renewed interest in Southern California kayaking and paddlers have been scouring topo maps and guidebooks, in search of runnable creeks and unique adventures. These notes refer to runs that require specialized equipment, specialized training, a high level of fitness and good judgement to kayak or canyoneer with an acceptable level of risk. The hazards and risks may not be evident without proper training and experience.It is impossible to avoid all risks when kayaking or canyoneering. Hazards such as flash floods, rising water levels, fallen trees, rock sieves, hydraulics, rocks and trees falling from above, footholds or handholds breaking, and bad weather are a threat to even the most accomplished and well prepared adventurer. Even if you are an experienced kayaker, please note that many of these streams are unusually small, steep, vegetated and congested. They generally have a very narrow range of flows at which eddies will exist, and control will be possible. These notes are not complete. Do not rely on these notes as your only source of information. * They are based on recollections and will most certainly contain errors and other inaccuracies. Descriptions may be added, deleted or modified without notice, at any time. *Preparing to boat a stream that has rarely, or never, been paddled is as large a part of the challenge, and the fun, as actually paddling it. Put-ins and take-outs have to be researched; gradients calculated; drainage area ascertained; precipitation and flow histories analyzed. If possible, the character of the stream must be determined. What does it look like? What does it feel like? What is the geology? Will there be too many portages? Are the big drops runnable? Are there impassable drops or waterfalls? Are there escape routes? How hard is it to get to the put-in? There are many such questions. Trying to answer them can involve driving, hiking, mountain-biking, running, or even cross-country skiing to a particular spot on a stream.